Great communication, very responsive to addition questions The bangle was delivered quickly and well presented. Superb quality great fit and something I will wear for many years. Thank you for your attention to detail. 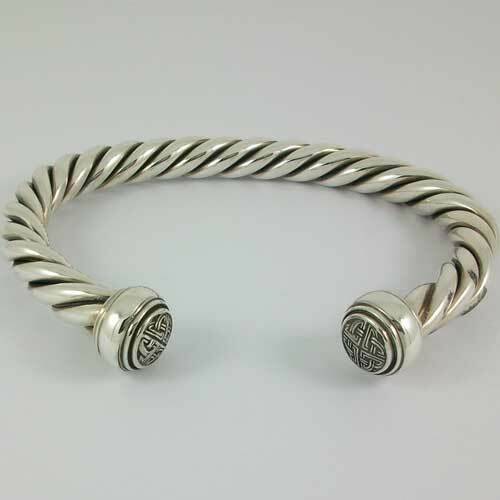 Bought 4 strand torc bangle for husbands birthday. Fantastic quality very fast delivery and perfect fit. Husband very pleased. Called to order silver torque bangle, very friendly helpful staff, torque was delivered quickly and I was very pleased with it. Lovely quality craftsmanship in a beautiful presentation box. Many Thanks. I have just received my 4 strand Torc bangle. It is very beautiful and very well crafted. A piece of pure celtic magic.Very swift delivery.